We have a goal. That goal is to make you an educated citizen. The reason why is because accidents happen every day in the cities we live in; they are impossible to prepare for. They key is to be informed before they occur, so that when they do, you are calm and empowered! Each week we are sharing an expression you may have heard before, broken down in a way that makes it easy to understand; real-world terms that you may come into contact with sometime in your life. What is Distracted Driving And Why Should I Care? Distracted driving is a danger to every person on the road. If you’ve ever reached for your cell phone while cruising the highway or checked a text message at a red light, you are guilty of driving distracted! According to the National Highway Traffic Safety Administration (NHTSA), in a recent year over 3,000 people were killed and over 380,000 injured as a direct result of distracted drivers. The more and more technology we have in the palm of our hand, the more this number increases. How many times have you turned to your handheld device to check the GPS or Snapchat? Or switched the radio station to find the perfect song? You can be classified as a distracted driver in three different ways. 1. If you are manually distracted. This is any way that your hands are taken away from the wheel and controlling the vehicle. 2. If you are visually distracted. To be visually distracted your eyes must wander from the road. For example, looking in the backseat to check on your passengers. 3. If you are cognitively distracted. This is when your mind is simply elsewhere, causing you to be less aware and alert. For example, being distracted by your “to do” list or a fight you just had with your loved one. You should care about distracted driving because… it’s a real problem that will probably affect you or a loved one behind the wheel at some point in time. Also, if you are the parent of teenagers, young people ages 17 -24 experience the greatest risk! According to laws in the state of South Carolina, texting and driving carry a fine of $25 for the first offense; those who are ticketed for this offense do not receive points on their license. With such a small penalty for such a potentially dangerous accident, it’s up to people to self-regulate their actions behind the wheel! 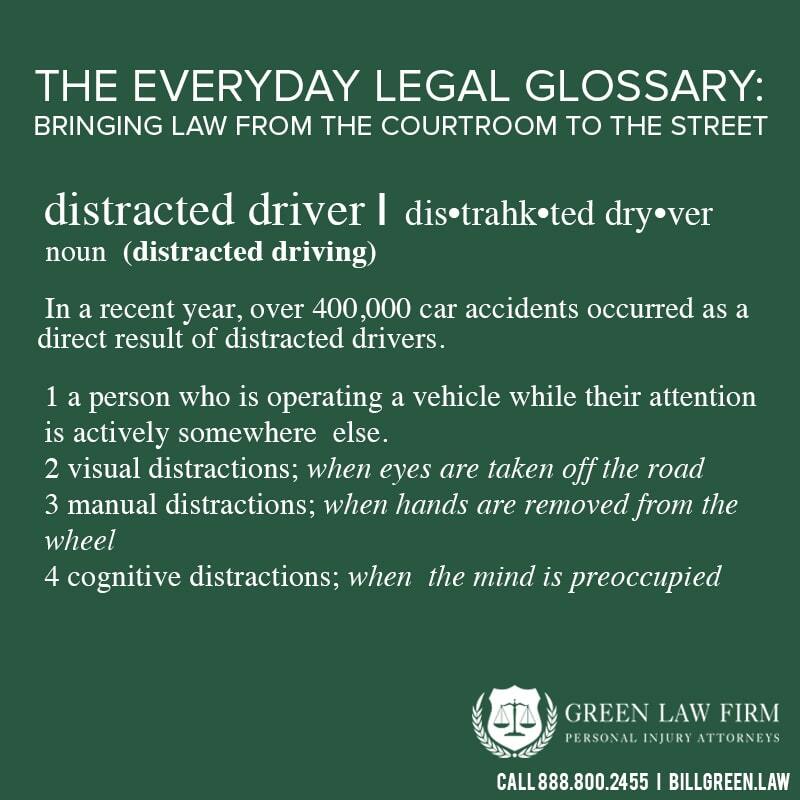 If you have been in an accident with someone who was driving distracted, the experienced team at Green Law Firm can help you recover potential damages! Contact us today for a 100 percent risk-free case review.